"Tai Chi and Qigong will play an important role in global awakening"
In his latest book, "A New Earth" visionary Eckhart Tolle writes "Tai Chi and Qigong will play an important role in global awakening." Eckhart Tolle proposes that "transcending our ego-based state of consciousness is not only essential to personal happiness, but also the key to ending conflict and suffering throughout the world." As evidence that Tai Chi and Qigong are now reaching the mainstream, Oprah Winfrey offered a 2-part program about the benefits of Tai Chi and Qigong on the Oprah show in Nov. 2007. The book "A New Earth" quickly became the New York Times #1 bestseller and the #1 bestseller on Amazon.com, so this positive message is reaching far and wide to the general public. 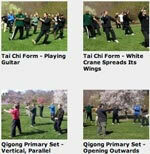 You can expect to see some new faces in Tai Chi class. The deadline for the registration for the Second World Cup Tai Chi Chuan Championship, 1st of August 2008, is approaching fast. This event will be held at the Taipei Arena (No 2, Sec 4, Nanjing E. Rd., Songshan District, Taipei, Taiwan) on the weekend of 18th and 19th of October 2008. Several YMAA members will be attenting and joining the competition, among them are Nicholas Yang and Jonathan Chang. The competition is open to everyone, and all YMAA students around the world are encouraged to sign-up and join in. Before the start of the competition, from the 12th to the 14th of October, 2008, Dr. Yang will present seminars about Qin Na (or Chin Na), Tui Shou (Pushing Hands) and Embryonic Breathing. Again, these seminars are open to everyone and the registration fee is only USD$60. So if you are interested in attending these seminars please register soon to secure your place. After the seminars, Dr. Yang will also be leading a small group of people to visit his hometown and several historical places in Taiwan. This is a very unique opportunity and trip as Dr. Yang rarely invites people to tour around places where he lived when he was growing up. If you would like to join Dr. Yang for the tour, participate in the seminar or to compete, then please sign-up as soon as possible. For purchasing flights to Taiwan, we recommend you to shop around at the Chinese travel agents or to check the internet to get the best prices. YMAA author Ramel Rones has spent the past decade applying his knowledge of the internal arts in his work through Dana Farber Cancer Institute, Mass General Hospital, Tufts-New England, and Harvard Medical School by helping to improve the quality of life of people dealing with Cancer, Arthritis, Fibromyalgia, and other issues. He has designed and implemented short Tai Chi forms and other mind-body exercise for clinical trials with groups of patients to finally study how and why the arts can be used for healing, from a Western medical scientific perspective. The Sunrise Tai Chi program, which quickly became the #1 bestselling Tai Chi DVD in the world, is used for healing Osteoarthritis. The techniques taught in the recent new Sunset Tai Chi program are now being used for healing Fibromyalgia. You may read more about his clinical trials, numbers 5 and 6. As the time to inaugurate the training at the YMAA California Retreat Center approaches, several candidates have started to post blogs to document and share their experiences. Ricardo Tonet's blog, "A Path to Mastery", contains many posts, along with video clips and photos. Ricardo started training at YMAA Portugal in May 2003. He was born in Luanda, Angola and is a Portuguese Marines Officer. In Maxim Cote blog (in French), "Le Blog de Maxim", we find a very personal and intense description about his experience during the Afghan war, where he served under the Canadian Army, and his decision to apply to the Retreat. Maxim started training at YMAA Quebec, Canada. Finally, Jonathan Chang's blog "YMAA CA Retreat Center Journal" contains many posts, photos and videos of his daily life experience at the Retreat Center. YMAA Publication Center have our first-ever ad in the June 2008 issue of Rolling Stone magazine, which is available on newsstands on May 16th. 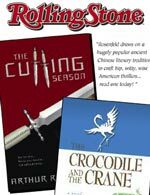 The ad features the popular books "The Cutting Season" and "The Crocodile and the Crane" by Arthur Rosenfeld, a critically-acclaimed novelist, journalist, martial artist and coach. Both books have won recognition and are nominated for the Best Book Award by the USA Book Award and also the Book of the Year Award by Foreword Magazine. Congratulations and thank you to Janelle and Arthur Rosenfeld for their last-minute assistance. YMAA Boston is looking to host an event benefiting the non-profit organization St. Jude Children's Research Hospital. St. Jude Children's Research Hospital is globally known and treats patients without regard to their ability to pay. It is also actively researching cures to many children's diseases and openly sharing its findings. St. Jude is the third largest health-care charity in America. Participants in the event must find sponsors. Alternatively, participants may help to sell spectator tickets to the event. All proceeds will go to St. Jude Children's Research Hospital. If you are interested in donating, participating, or helping to organize this event, please contact YMAA Boston ASAP! YMAA students in Boston celebrated World Tai Chi Day on Saturday, April 26, 2008 at the very beautiful Arnold Arboretum (which is also the setting of several instructional YMAA DVDs). You may view photos of the gathering on the new YMAA Boston website. The website has also been updated recently with videos of training at YMAA Boston school, and from demonstrations and seminars around the world. YMAA Boston will have a Summer Break to facilitate participation in the YMAA Portugal Summer Camp, July 28 - August 3rd. Some instructors will still be holding classes during this week. Officially, classes in Boston resume August 4th. Visit the YMAA Channel on YouTube to see new DVD preview trailers and other YMAA-related videos. Many YMAA students have connected with us on YouTube and have shared some amazing clips from seminars and demonstrations around the world. You can see Kathy Yang performing Yi Lu Mei Fu, Longfist Gongfu, several clips of Grandmaster Li, Mao-Ching, a very young Ramel Rones getting Chin-Na'ed, footage from students at the Retreat Center, and rare clips of Master Yang performing various sequences, such as Chen Taiji and Yao Gu, White Crane Gongfu. Discuss the YMAA YouTube videos now in the YMAA Forum. Nicholas C Yang has launched a new website for the YMAA Boston Headquarters School, with the assistance of YMAA senior students Axie Breen and Tony Chee. 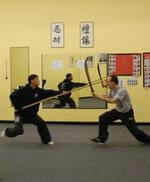 The YMAA Boston School website includes Boston instructor photos and biographies, a history section, and an updated martial arts class schedule. There are several special classes and seminars starting soon. The YMAA Boston school offers a free trial week, for adult or children's classes, so you may try the Shaolin Kung Fu or Taiji classes. New students receive a book by Dr. Yang, a uniform (T-shirt and silk/cotton pants), and a copy of the YMAA training manual with their registration. Check back often as the site continues to get updated with more pictures, videos, and articles. Subscribe to the YMAA Boston mailing list for updates on classes, seminars, and upcoming news/events. YMAA senior student Ian Factor has returned to the USA after an extended residency as director and teacher of painting and drawing at The Siena School for Liberal Arts in Italy. For the last decade, Ian has travelled the world, spending years backpacking and painting across Europe, refining his skills as a classical artist. You may be familiar with some of his paintings of Dr. Yang that hang in the Boston Headquarters school. He is an exhibiting artist member of the National Arts Club in Gramercy Park, NYC, and will offer Summer 2008 painting seminars in Siena and Puglia, Italy. A martial artist for 25 years, he also makes time to train and teach martial arts at home and abroad. Ian's work will be featured at Gallery 55, S Main St, Natick, MA (508-740-0260). The show consists of about 40 new pieces, the subjects mostly from Italy, and several from Portugal and NYC, representing the newest of his work from this last year of painting in Siena Italy, and his transition to now living in NY. The opening is Friday April 18th from 5pm-8pm with an artist's talk on Saturday April 19th from 12-1pm. Ian's website is www.ianfactor.com. The YMAA CA Retreat Center is ready to host guests as visiting short-term students, and for the Summer seminar series. The beautiful 240-acre grounds offer walking trails, many spaces to reconnect with nature, and an ideal outdoor setting for intensified training. The guest quarters have recently been completed, with various lodging options depending on your budget - from cabin floors to a full guest suite with private shower. A Hi-Definition video screen and surround-sound system is available for study of video presentations. The common space has seating for 25~30 persons, wifi access, heated wooden floors, eco-friendly solar energy, and pristine spring water. The Summer seminars from July 11 to August 21 include Taijiquan, Pushing Hands, Chin Na, Qigong, and Taiji Ball. Click here for more photos, information and to register for the Summer Seminars. Dr. Yang and a group of volunteer students have arrived and settled in to the YMAA Retreat Center in CA. The five day cross-country trip went smoothly, with stops in Ohio, Iowa, Utah, and CA. Upon arrival in Northern CA, the long process of unpacking the contents of Dr. Yang's entire life began. Work resumed on various projects that have been ongoing, such as clearing land, preparing the training space and lodging, and planting an organic vegetable garden. Retreat Center candidates and YMAA students will be arriving weekly to join in the training and assist with work needed at the Center, until the Summer Seminar session begins in July. Click here for more photos, up-to-date progress reports, and access to all Retreat Center activities. 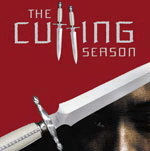 The Cutting Season, a novel by Arthur Rosenfeld and published by YMAA Publication Center, has been nominated as a finalist for the "Best Books Award 2007" by the USA Book Award and also as a finalist in the Foreword Magazine Book of the Year Award, whose winner will be announced at BEA, on May 29, 2008. "I'm always delighted and honored to have my work recognized" said Arthur Rosenfeld, upon receiving the news about these nominations. 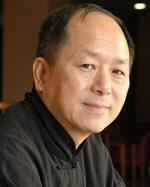 On March 8th, Dr. Yang will leave Boston, where he has taught for over 25 years. He'll spend a week driving across the United States, with a few student volunteers, and in mid-March 2008 he will begin the next chapter of his life at the YMAA Retreat Center in California. Many people have contacted us asking for an easy way to support Dr. Yang in his new endeavor, so we have found a simple solution. Click here to go to the donations page. You can make a single donation or set up smaller monthly payments through Pay Pal. You don't need to have a Pay Pal account, and it takes about 1 minute. Donations are tax-deductible because the Center is not-for-profit. The journey is beginning; are you on board? Join the Retreat Center community, and be a part of a project that will change the landscape of the martial arts world and preserve the arts for future generations. Approximately 40 YMAA members gathered at the Green Tea Restaurant in Newton, Mass., to wish Dr. Yang, Jwing-Ming a happy and prosperous farewell. Well, it's not exactly a retirement because Dr. Yang plans to continue teaching martial arts at his new digs, the YMAA Retreat Center in Northern California. This is a new venue for Dr. Yang, since he has spent the majority of his adult life teaching Kung Fu at YMAA Boston in Jamaica Plain, Mass. However, he has always dreamed of preserving the ancient Chinese martial arts in some form or another. Since 2004, that dream has become a reality with the construction of a new building that sits on a pristine plot of land surrounded by redwood trees near Humboldt County. 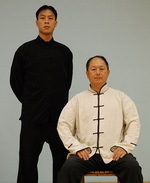 The two goals of the Retreat Center are to raise the standard of Chinese martial arts training in the Western world, by demonstrating high levels of skill, morality, humility, and spirituality and to communicate the true depth of the traditional Chinese arts and culture to mainstream America and the world. There's no doubt in this writer's mind that he'll succeed as he has in practically every job that he has tackled. Sunny Wong, co-owner of the Green Tea Restaurant served up a gastronomical array of food, buffet style, and also wished Dr. Yang "much success" at his new and exciting venture. Nicholas Yang and Michael Vasicek successfully passed the qualification test (photo on left) to graduate as YMAA Instructors in Shaolin Kung Fu, the tenth level of the YMAA Shaolin Kung Fu program. The last sequence performed in the test was the "Saber Against Spear" matching set. Nicholas has been learning martial arts from his father, Dr. Yang, Jwing-Ming, since his childhood and has won several medals in both national and international competitions. 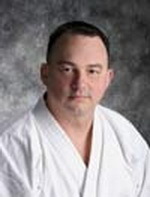 Mike Vasicek started his training at YMAA Boston in the early 90's with a background in Kempo Karate. He has trained diligently at YMAA ever since and has set an excellent example for his fellow students. Recently, Mike moved with his family to the Czech Republic, where he intends to open a YMAA branch school. He returns regularly to YMAA Headquarters in Boston to train with Dr. Yang and the other students. Also, recently graduating as Qigong Assistant Instructors are: Bette Croce, Dale Kukielka, Joshua Miller and Panagiotis Kontaxakis. In April 2008, Kris Wilder will visit the UK for a two-day seminar on Kata Bunkai and Effective Karate hosted by Iain Abernethy. The event will occur during the 5th and 6th of April 2008, in the Kendal Judo Club, Cumbria, United Kingdom. Kris Wilder is the co-author of the book "The Way of Kata" (along with Lawrence Kane), published by YMAA Publication Center. The book is regarded as one of the most thorough and practical books on the application of kata and has received praise from many martial artists. Kris is also the author of "The Way of Sanchin Kata: The Application of Power". Kris Wilder has been involved in the Martial Arts since 1976, earning black belt ranks in Karate, Taekwondo and Kodokan Judo, which he teaches at the West Seattle Karate Academy. He has trained under Kenji Yamada; Shihan John Roseberry, a student of Seikishi Toguchi; and Hiroo Ito, a student of Shihan Kori Hisatake. He is also a contributor to Traditional Karate Magazine and a promoter. During his recent visit to YMAA Boston, Paul Moran, the leader of YMAA Ireland, attended the Qin Na Seminar and completed all requirements for testing. After a thorough evaluation by Dr. Yang, witnessed by all Seminar attendees, Paul graduated as a Qin Na Assistant Instructor. Also graduated and joining the rank of Qin Na Assistant Instructors are Bill Buckley, a senior student from Boston, and John Wicker from Indianapolis. The diligent practice and study by Robert Was (pictured left), the leader of YMAA Poland, were finally compensated by attaining the title of Taijiquan Instructor, the 5th level of Taiji in the YMAA training program. 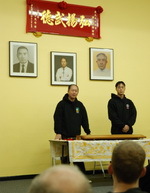 Robert also tested and attained the rank of Qigong Assistant Instructor. Also during this busy week, a new school, YMAA Amesbury has been officially affiliated to YMAA, located in Northern Massachussetts and led by Scott Tarbell. The meeting on the evening of January 25, 2008 was an auspicious occasion, attended by many participants, including many school directors of the European schools and senior instructors. Dr. Yang gave a general outline of his plans for the next ten years, and extended an invitation to everyone to join in the training at the Retreat Center in California. He announced that he will return to Boston each February to offer a month of seminars, testing, and to meet with all YMAA students. There was also an informal ceremony in which Master Yang discussed the history of YMAA, and then passed on the Boston Headquarters School and the Presidency of YMAA International to his youngest son, Nicholas Yang. Dr. Yang presented Nicholas with his two favorite swords, a specially-weighted Emei Mountain sword originally given to him from Grandmaster Liang Shou-Yu, and the 20-Year Anniversary Han Dynasty replica sword given to him from the YMAA students. At the end, Nicholas took questions from the audience, and stated that the future of YMAA is to raise the standard of Chinese martial arts, bring the martial arts community together, and to continue the expansion of the YMAA International family. A YMAA Winter training camp will be held between February 23rd and March 2nd, 2008, at the Sports Hall of LKS Beskid Brenna in Brenna, a small village in the Southern part of Poland. Open to the public and all YMAA students. Registration fee is 225 Euros (about USD$330). 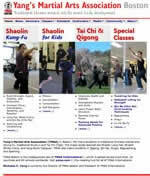 Topics include Taijiquan, Taiji Ball Basic Training, Shaolin/Sparring, and Basic Staff. During the Camp, grading tests will be given from level 1 to 3 of Taijiquan, and from level 1 to 6 of Shaolin Kung Fu. Depending on the topic you study, some equipment will be needed, such as a ball of any kind (for Taiji Ball), training gloves, jump rope, shin protection, helmet, groin protection, plastrons, shields (all for sparring), and a staff (for Shaolin and Taiji staff training). Instruction will be given by senior YMAA instructors. Registration deadline is February 10, 2008. If you intend to participate, please register as soon as possible and visit the YMAA Poland site for more information. On January 1, 2008, Nicholas C Yang officially became President of YMAA International. He will manage all business and activities of YMAA International and will preside over classes at the YMAA Headquarters School in Boston, MA, continuing to offer the same full YMAA curriculum in Shaolin and Taiji classes. Winter seminars will be continued at the usual time of year in Boston, while Summer seminars by Dr. Yang will be offered in California at the YMAA Retreat Center. From all of us at YMAA.com, YMAA Publications, and the entire Association of YMAA Schools, welcome Nicholas Yang as the new president of YMAA! The World Cup Tai Chi Chuan Championship 2008, scheduled for October 18th and 19th, 2008, will be held in Taipei, Taiwan and all YMAA students are invited to join and compete with fellow practioners from around the world. This event had over 10,000 attendees in 2007. Dr. Yang will present several seminars, between October 12 - 18, including Qin Na, Tuishou, and Embryonic Breathing Qigong. Dr. Yang will also perform Taiji during the opening ceremony demonstration. Interested YMAA students can tour with Dr. Yang and visit the locations where he trained in his youth. More information about the competition can be found at the organizers' website, the World Tai-Chi Chuan Federation. Flash site - takes a few moments to load. If would like to join Dr. Yang's tour to Taiwan, please view 2008 Taipei Tournament Traveling Schedule. Next Friday, the 25th of January 2008, all YMAA adult students, instructors, school and coach directors are invited to the staff and general meeting to be held at 6:30pm, in the training studio of YMAA Boston Headquarters. Included in the topics for discussion will be the 2008 plans for YMAA. Many senior students and instructors, as well as international school directors will be present at this important event.